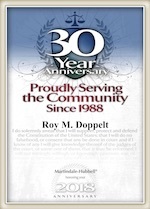 The Law Offices of Doppelt and Forney, APLC is a full-service family law firm located in the Rancho Bernardo Area of San Diego County. We specialize in all aspects of family law including divorce, legal separation, child custody, child support, spousal support, attorney’s fees, residence exclusion orders and more. At the consultation, your lawyer will provide you with legal analysis and offer techniques and strategies to obtain your goals. We can assist with income withholding orders for wage garnishments. We can run guideline child and spousal support calculations so you have realistic expectations. We will perform and conduct legal research as needed. We prepare the petition and summons and all the initial dissolution pleadings for filing with the San Diego Superior Court. We can prepare the marriage settlement agreement and judgment pleadings. Our firm assists with the preparation of all pleadings and court appearances as necessary including the family resolution conferences. We also handle post judgment motions including motions for modification of child and spousal support and the parenting plan as well as motions to set aside the judgment and enforcement of the judgment. Call today to learn how The Law Offices of Doppelt and Forney, APLC can help you with your family law case in San Diego. With the holiday season just around the corner, many parents are starting to feel the anxiety that comes with co-parenting during the holiday season. While many larger holidays and breaks are written down and agreed upon in the parenting plan, Halloween is often left out. That doesn’t mean both parents and the kids can’t have a fun Halloween. A recent case from the Third District Court of Appeal addressed an interesting question. If a marital settlement agreement called for a wife to receive $475 monthly as her community portion of her ex-husband’s military retirement pay, what happens if the husband elects to receive a form of military disability compensation (which is typically separate property) instead of his retirement (which is community property)? In this case, the court concluded that the wife was entitled to her $475 per month, regardless of what the husband elected. The payment represented what would have been her portion of the retirement pay, and she did not lose her right to receive that money simply because the husband made a voluntary and unilateral choice not to receive that retirement. Under established California law, family courts are authorized to divide community (or marital) property between the divorcing spouses. Such property may include any number of items, including the family home, investments, retirement benefits, and any other assets accumulated during the marriage. Not included in this division are items that have been identified or characterized as separate property, belonging to each spouse independently. Distinguishing between community and separate property assets can have a tremendous impact on the outcome of a divorce proceeding. In order to protect your property rights, you are encouraged to contact a local San Diego family law attorney who has extensive experience representing parties in divorce proceedings. In some cases, a couple’s marital separation agreement (or “MSA”) will address their individual rights to property after the divorce. It is important to pay close attention to such a division, since the language of the MSA can have the effect of foreclosing a court’s jurisdiction over any items identified as separate property. In a recent California case, the wife sought to enforce the MSA (among other requests for relief) as it related to various corporate claims. In this case, the parties were married in 1996 and separated in 2009, and the court entered a judgment of dissolution in 2010 as to status only. In 2011, the court further issued a judgment on certain remaining issues, incorporating the parties’ MSA. Some of the most significant issues that arise in divorce or separation proceedings involve the couple’s children, such as child support, custody, and visitation. Courts in San Diego and throughout the state take these matters seriously, especially child support. The legal system operates in such a way as to assist the child in obtaining the support he or she needs. For instance, parties are able to seek the assistance of California county agencies when attempting to enforce a parent’s court-ordered child support obligation. One of the reasons that courts get involved in such matters is that children are unable to advocate for themselves. Child support cases can become complicated and difficult, depending on the particular circumstances. In any family law case where there are children involved, parties are encouraged to seek the assistance of an experienced San Diego family law attorney as early as possible in the proceeding. In a recent California case, a couple that divorced in 2007 disputed the wife’s right to enforce a judgment lien against certain real property that was deeded to the husband under their marital settlement agreement (“MSA”). She was attempting to enforce the lien to recoup child support payments. The wife claimed that under the terms of the MSA, which divided the couple’s assets and other rights and obligations, the husband was required to pay the wife $2,000 in monthly child support and to secure and maintain health insurance for their two daughters. Under the agreement, the husband received one property that was free of debt at the time of the divorce. However, in 2008, the husband arranged for a loan on the property. He subsequently followed through with his child support obligations for a period of time. One way to reduce the length of a divorce proceeding is for the parties to resolve most of the significant issues through a marital settlement agreement. While this may not always be feasible, spouses will benefit from having a certain amount of control over the fate of the process. Of course, a judge will have to sign off on any resulting agreement. In some cases, however, one party or the other may seek to challenge, clarify, or enforce the settlement agreement in the future. To ensure that your marital settlement agreement complies with local applicable law and will stand up in court, you are encouraged to consult with an experienced San Diego family law attorney as early in the divorce as possible. Martial settlement agreements may cover a myriad of issues. For example, in a recent case, the couple’s marital “termination” agreement (as it was called in 1987) required the husband to establish a life insurance trust for his soon-to-be ex-wife. Here, the parties were married in 1957 and divorced in 1987. The couple entered into this marital termination agreement, which was approved by the court at that time. In 2013, the wife filed a request with the court seeking an “Order to Disclose Insurance Information.” Essentially, it seems that the wife was hoping to obtain proof that the husband established a life insurance trust for her in accordance with the termination agreement. Many different factors can affect the length and cost of a divorce proceeding, not the least of which concerns the parties’ ability to negotiate and interact with each other in a civil and amiable manner. Spouses who are able to work together to reach an agreement on the main issues, such as the division of property, spousal support, and other financial matters, will certainly achieve a more efficient settlement than parties who are contentious and unable to set aside their differences during this trying time. Many divorcing parties seek the assistance of a local family law attorney, someone from the San Diego area who can navigate the proceedings and facilitate an efficient and smoothly run process. The importance of reaching a mutually acceptable marital settlement agreement cannot be overstated. Keep in mind that such an agreement must comply with local state laws applicable to the validity of contracts generally. In a very recent case, covered by the news media, a California judge overturned a divorce settlement reached between actor Terrence Howard and his wife, Michelle Ghent. According to reports, Ghent allegedly “coerced” Howard into signing the agreement by threatening to leak details of his private life. According to the court, the evidence of extortion or duress was un-rebutted. By virtue of this ruling, the Superior Court Judge is now forcing the parties to re-negotiate any financial matters related to their divorce.